The O.J. Noer Memorial Turfgrass Collection began as the sizeable private library of outstanding agronomist and turf expert O.J. (Oyvind Juul) Noer (1890-1966). Throughout his career, O.J. Noer accumulated many books, journals, and conference proceedings related to the science, culture, and maintenance of turfgrass. Upon his death, the O.J. Noer Research Foundation was formed to honor his name in support of turfgrass research and education. It was soon voted to place this valuable collection into the hands of an accredited institution of higher learning so it would be universally available to turfgrass students. Michigan State University was selected at the behest of Dr. James B Beard, then of the Department of Crop and Soil Science, and Dr. Richard E. Chapin, then-Director of Libraries. The O.J. 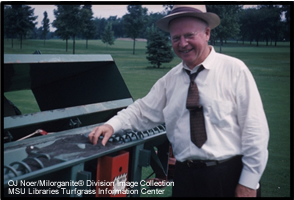 Noer Memorial Turfgrass Collection was officially donated to Michigan State University in 1968. This served to expand the existing collection of turf literature that had evolved during a concentrated effort to increase the MSU Libraries' turf holdings through the 1960's, which was a cooperative effort of both teaching and library faculty. Other private contributions included items from Dr. James Watson, Mr. Thomas Mascaro, Dr. John Gallager and Dr. James B Beard. Valuable books and publications were solicited by Charles G. Wilson and James Latham on the behalf of the O.J. Noer Foundation. Since that time, the O. J. Noer Foundation has supported the purchase, when necessary for acquisition, of historic items not yet owned. Subsequent major donations have included materials from the United States Golf Association Green Section (USGA), Golf Course Superintendents Association of America (GCSAA), Dr. William Daniel, Dr. Kenyon T. Payne, Mr. Fred Opperman, Dr. Paul Rieke, the family of Dr. Kent Kurtz, Mr. Jerry Matthews, the family of Dr. Fred Grau, the Milwaukee Metropolitan Sewerage District (MMSD), Dr. Douglas T. Hawes, Mr. James T. Snow, and Dr. Jack Hall. This on-going effort continues to strengthen the Collection, and thus make more of the rich tradition of turfgrass literature available for future generations of scholars, students, and professionals. Together these holdings, along with ongoing MSU acquisitions and continuing donations from a wide range of individuals, comprise a collection of turf related material that is generally recognized as the finest publicly accessible one in the world. MSU is also home to the James B Beard Turfgrass Library Collection, as well as the Noer/Milorganite® Image Collection, which is a collection of images that includes 14,000 35-mm slide images originally organized by O.J. Noer. Come to the Collection and locate materials yourself. Some materials of the Noer Collection held within the Main stacks may be borrowed through your local library's Inter-Library Loan capability. Take a copy of the full TGIF record to give them when you make the request. See our Interlibrary Loan and Document Delivery restrictions. From his beginnings as a graduating soil scientist from the Department of Soil Science, University of Wisconsin-Madison, O. J. Noer went on to become the State Soil Chemist in 1914, and is credited with helping to establish the first soil testing laboratory in the country. During and after the First World War, he served overseas as captain in the Chemical Warfare Service. From 1922-1924 he was in charge of all investigational and experimental work in conjunction with determining the agricultural value of Milorganite under a fellowship grant at the College of Agriculture, University of Wisconsin. Later, as Head of the Milwaukee Sewerage Commission Turf Service Bureau from 1926-1960, O. J. Noer visited/inspected perhaps 80% of the golf courses in North America advising on turf maintenance problems. Noer made many contributions to the diagnosis of turf problems, and wrote and spoke about turf at conferences almost continuously through the period. The ABC of Turf Culture (TGIF R=251), his 1928 classi c, represents one of the earliest integrated works on the subject. Search "Noer" in the Turfgrass Information File (TGIF) database to identify other articles by or about O.J. Noer or see this TGIF search of TGIF materials written by or about O.J. Noer to learn more about this turf pioneer! 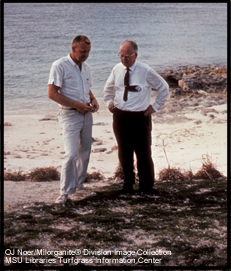 A friend and advisor to all, O. J. Noer was a man "whose educational background, broad experience and intimate contact with the everyday problems of those concerned with growing turf qualify him as an outstanding authority in his field". To honor the only three-time recipient of the GCSAA Distinguished Service Award (1952, 1959 and 1960), the 1960 GCSAA Conference, in Houston, was dedicated to O.J. Noer upon his retirement. In 1963, he received the USGA Green Section Award "For distinguished service to golf through work with turfgrass". His name was entered into the Wisconsin State Golf Association's Hall of Fame at the 1985 Wisconsin Golf Turf Symposium. Before and after his death on July 12, 1966, O. J. Noer has been considered a true pioneer in the turfgrass industry.